Not just three dopers -- at least four! Do you believe in redemption, and the power of second chances? Or was what went down Thursday in Lausanne, Switzerland, just the saddest of all possible advertisements for track and field? Three dopers, all American, went 1-2-3 Thursday in the sport’s glamor event, the men’s 100 meters, at the Lausanne Diamond League event: Justin Gatlin, Tyson Gay and Mike Rodgers. Grenada’s Kirani James and American LaShawn Merritt went under 44 seconds in the men’s 400, James winning in a world-leading 43.74 seconds, Merritt in a season-best 43.92. The women’s 100 saw a sub-11: both Michelle-Lee Ahye of Trinidad & Tobago and Murielle Ahoure of Ivory Coast timed in 10.98, Ahye getting the photo finish. Barbora Spotakova of the Czech Republic threw the javelin 66.72 meters, or 218 feet, 10 inches. An 18-year-old Kenyan, Ronald Kwemoi, ran a personal-best 3:31.48 to take out Silas Kiplagat and others in winning the men’s 1500. In the men’s high jump, Bogdan Bondarenko and Andriy Protsenko, both of Ukraine, went 2.40m, or 7-10 1/2. There have now been 50 2.40m-plus jumps in history; 12 have been in 2014. And yet — what’s the headline from Thursday in Lausanne? Gatlin ran 9.8 to win, his second-fastest time ever, off his personal best by just one-hundredth of a second. Gay, in his first race back after a year away because of suspension, went 9.93. Rodgers, who last week won the U.S. nationals in Sacramento, ran a season-best 9.98. Ah, but it doesn’t end there. Typically, of the eight guys in a 100-meter final, it’s not unreasonable — at least since 1988, and Ben Johnson — to wonder, how many might be dopers? In this instance, we have at least an inkling, and it wasn’t just three. To the inside of Gay in Lane 2, Rodgers in 3 and Gatlin, the 2004 Olympic champion — all decked out for the Fourth of July in red, white and blue — in Lane 4, we present Pascal Mancini of Switzerland, in Lane 1. He finished eighth, in 10.43. Mancini was busted for nandrolone. Rodgers tested positive for a stimulant and drew a nine-month ban. Gatlin served a four-year ban between 2006 and 2010 for testosterone. Gay tested positive for an anabolic steroid last summer. He received a reduced one-year suspension for cooperating with USADA. Neither the IAAF nor WADA appealed. What Gay told USADA — and in particular about Jon Drummond, who trained Gay from 2007 until just after the 2012 Olympics, and has for years been an influential figure in USA Track and Field circles — remains unclear. Drummond is such a key figure that he served on the USATF panel that released its findings Thursday about the disqualification controversies at the indoor nationals in February in Albuquerque. Drummond, meanwhile, has filed a defamation lawsuit in Texas state court against USADA; its chief executive, Travis Tygart; and Gay. That case is likely on its way out of state court and en route to federal court. “My journey rebuilding my career has been an eye-opening experience,” he said. “It let me understand what real life was about outside track and field. I was basically sheltered by track and field all the way from high school, got a full scholarship to college, two years in college, turned professional, one of the highest-paid post-collegiate athletes. Then I didn’t run for four years, so I was able to understand what being a man in the real world is about, and struggles, and once I came back to the sport, I was grateful. “I wish him [Gay] luck because it can be a stressful time, not only on the track but what the media thinks about you, what personal [things] people think about you and how they look at you. It’s going to be with him for the rest of his career. I’ve been back in track longer now than for how long I was away for and every year I’ve got better and better. That’s only been my focus and maybe he can take a lesson from that, or if he wanted to go his own path. As should be obvious, track and field has many, many issues. It also has incredible strengths. It is universal. It is elemental. It is primal. For these strengths to come through, the sport must be able to assert its credibility. The only way that can happen is for fans to believe what they are seeing is real. 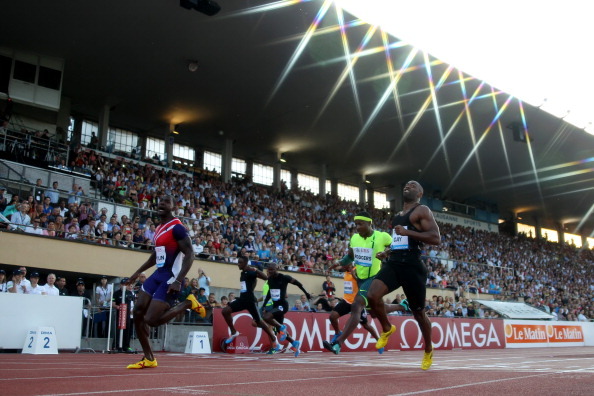 When a race like the Lausanne men’s 100 goes down, it can be a huge turnoff. No two ways about it. The tension, of course, is that Gatlin, Gay, Rodgers, Mancini and who knows who else have a right to make a living. There’s another tension, too, and it was beautifully described by the former Irish steeplechase record-holder Roisin McGettigan, who found out this week that she was being upgraded to a bronze medal at the 2009 European indoor championships. Which leads, perhaps in a meandering fashion, perhaps not, to the men’s 200 Thursday in Lausanne. In May, Yohan Blake, the 2011 100 world champion, had run a spectacular anchor leg, an unofficial 19-flat, to power the Jamaican team to a world-record 1:18.63 in the 4x200 relay in the Bahamas. On Thursday, Panama’s Alonso Edward won the 200, in 19.84. Blake, who likes to call himself the Beast, got off to an indifferent start Thursday, and that’s being gracious. He faded down the stretch. He finished sixth, in 20.48. Nickel Ashmeade of Jamaica took second, in 20.06. France’s Christophe Lemaitre got third, in a season-best 20.11, and as he went by Blake, he gave him a stare, like, what is up, dude? Blake trains with Usain Bolt, with coach Glen Mills. Blake suddenly looks awfully, well, un-Beast-ly. Bolt has yet to appear this summer. At the end of last July, the world found out, thanks to World Anti-Doping Agency statistics, how minimally Jamaican sprinters had been tested and, in turn, how lax the Jamaican anti-doping program had been. Now, in summer 2014: is it just that those Jamaican yams simply aren’t doing the job? Or is there a different truth waiting to emerge?